Venezuelan opposition leader Juan Guaidó will be barred from holding further public office for 15 years, the maximum allowed by law, the state financial controller has announced. Comptroller Elvis Amoroso said Mr Guaidó's personal financial statements contained inconsistencies. Mr Guaidó, head of the opposition-controlled National Assembly, declared himself interim president in January. He has the support of more than 50 countries, including the US. The BBC's Will Grant in the Venezuelan capital Caracas says the decision to stop Mr Guaidó from holding office would come into force if he decided to put himself up for re-election at the end of his current term in the National Assembly. Mr Guaidó rejected Mr Amoroso's announcement, saying that he was "not auditor general". "The legitimate congress is the only one with power to designate an auditor general," he said. Last week, Mr Guaidó's chief of staff Roberto Marrero, 49, was accused of planning "acts of sabotage" against officials after being arrested. Venezuela's Interior Minister Nestor Reverol said that "weapons and foreign currency" were found by intelligence services during a raid on his home. 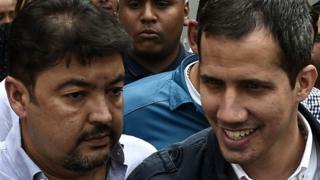 Mr Guaidó said the security forces had committed an "illegal and unconstitutional" act, adding that he believed the items allegedly found at Mr Marrero's home had been planted there. With the backing of the Trump administration, Mr Guaidó has been leading calls for Mr Maduro to stand down as president as discontent with his socialist regime grows. What was the international reaction? Mr Marrero's arrest has provoked international condemnation, with the US, the European Union and Latin American nations all demanding his immediate release. On Friday, Sigal Mandelker, a top US sanctions official, said the United States intended to put "maximum pressure" on the Venezuelan government. 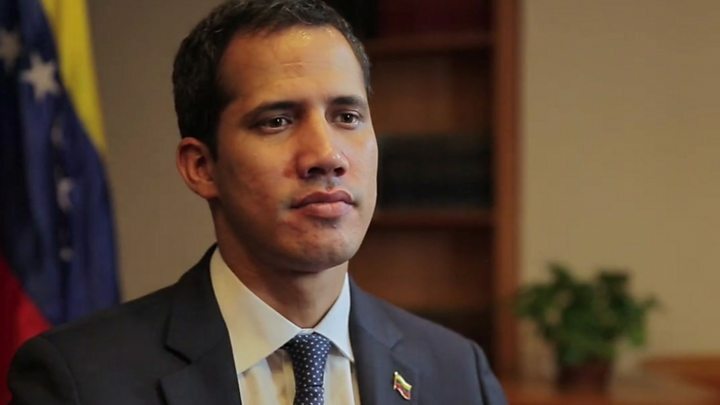 The European Union's foreign policy chief, Federica Mogherini also condemned the action against Mr Guaidó. "Such a political decision without regard to due process is yet another demonstration of the arbitrary nature of judicial procedures in the country," said Ms Mogherini. She said the EU would allocate a further 30m euros (£26m) in emergency funds to assist Venezuelans most in need. What have Venezuela's presidential rivals said? Mr Guaidó has been recognised as leader by most of the countries in Latin America. Mr Maduro, who still has the support of China and Russia, accuses the opposition of being part of a US-orchestrated coup. What is the latest from the US and Russia? On Thursday, Moscow responded to comments made by President Trump after he insisted that Russia should "get out" of Venezuela. Russian foreign ministry spokeswoman Maria Zakharova said: "To tell Russia to 'get out of Venezuela' is going completely over the top. This is total boorishness on a global scale." Mr Trump's remarks came after reports that Russian troops and equipment had been deployed to Venezuela. Two Russian military planes were spotted at Venezuela's main airport on Saturday.